The guide on how to plan a website structure is going to show you why and how to plan your website. So that you are enhancing your SEO and user experience. The thing is that SEO and user experience work together. So, it’s better to plan beforehand and then jump into design stuff. Yes, I know it’s tempting to go straight into visual design. But, the process is easier if you know what you are getting for your business. What is the Website structure? Basically, it’s how your website sites are connected. How your main pages lead to deeper pages on your website. You can see it as how your navigation and sitemap are built. 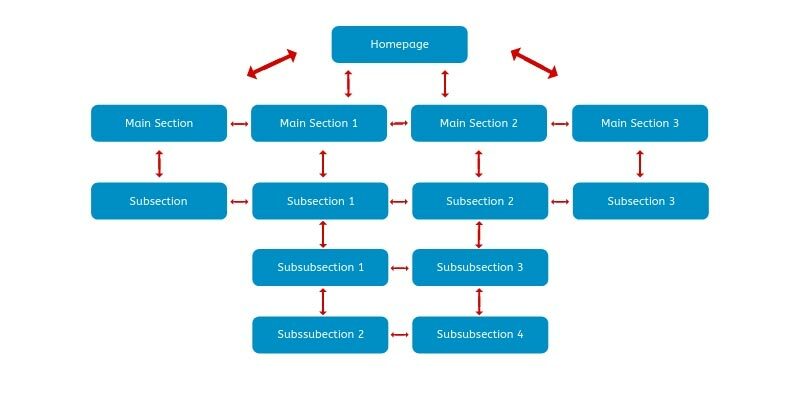 Why Plan a Website Structure? Well, you wouldn’t build a house without a plan, so why would you want to build your business website without it. It can help to improve your user experience, your SEO, your internal linking and the simplicity of usage. You should understand that planning a structure isn’t just about the main website, it’s also about the blog and internal linking. Let’s dive more into details. If we strip the site down to its bare bones. Meaning we take away the colors, the fonts, and other design elements, it remains all about the structure. You see, if a visitor can still find all the information easily it enhances his user experience. And most importantly the visitor stays longer on your site. This will have a direct impact on your SEO. As search engines look at the data, like bounce rate and time spent on your website, the longer the visitor is on your website the better your website will do in search engines. So make sure your navigation makes sense and that your visitors can find important pages fast and with ease. If we plan the structure it can also help you build groups of pages (also called content silo). In order for your website to show up in a search engine, your website has to be accessible to web crawlers. And further for web crawlers to discover your pages your website needs to have a good structure. Even more, because it can happen (even with Google), that they are not able to find every page on your website. 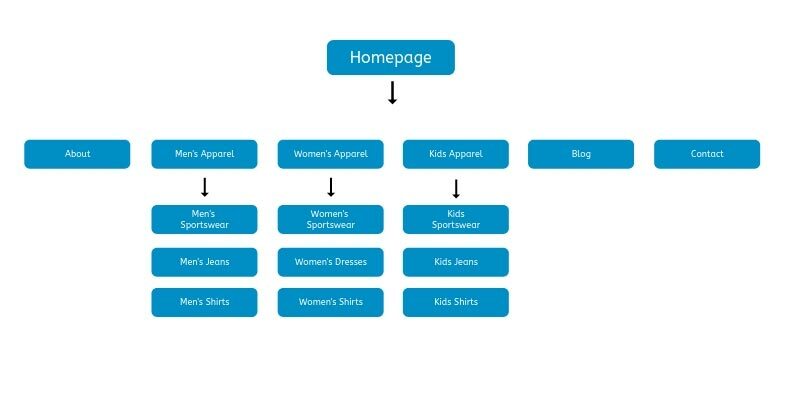 So having a sitemap is crucial. And by doing that you’ll have a better way of telling search engine on how your content is connected. You remember that I talked about silos, right? Well, this is where it comes in handy. When creating content groups, you are internally linking to between those pages. It’s even more important that you know which site is getting the most backlinks, so you pass the authority from that site to others. You see, usually, most of the backlinks come to your home page. So it’s a good idea to have a link from there to your services and blog. It’s good to structure your home page as a preview page of what you do and offer. Well, if you plan out your website structure you also research your competitors and keywords. That way you get a good foundation to plan out your navigation and your content plan and structure. And by having all of that you get the estimate of how much of the traffic you can get. If you are doing a plan for a new website or a website that was just lying on the web, then you focus and the easiest keywords with the most search traffic that they can offer. This also depends on your language and area. 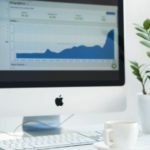 If you are looking for a keyword in bigger markets, like the UK, Germany or the US, then you want probably your keywords to have around 1000 monthly search volumes. But you can go for less if you want to be more certain you will get the traffic. When you have your estimate of the traffic you can also start talking about conversions and what you need to do to have a higher CRO. See everything is connected, so you can then really plan for your website’s success. Let’s dive into steps that will get help you create your website structure. Why Creating a Simple Simple Structure and Sitemap is Not Enough? 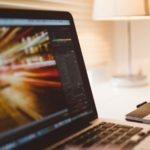 By creating a website structure you’ll save yourself a headache. Because you’ll have the list of the pages and the titles right in front of you when creating pages. Also, you’ll know your pages descriptions up front. Well, at least you’ll have them planned. The fact is, that by doing your research and your website structure before designing a website you’ll know where and what your potential clients are searching for and how you’ll compare to your competitors. So you see, just a simple sitemap and a structure are not enough. They are not showing you the right picture if no research is there to back it up. With the research done you know exactly what pages to create, what the website structure will look like and what content you’ll need. Planning ahead for content marketing. Here you’ll learn how to plan it out and what steps you should take to get the most out of it. You should also know that this will work for new or an already existing website that needs a redesign. 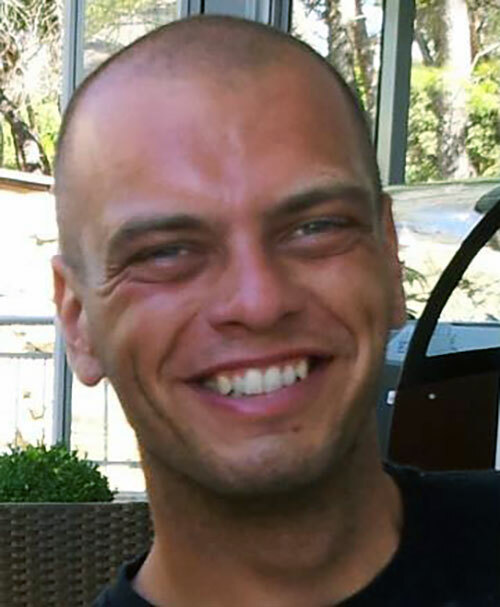 This is how I do it if I were to build your website or an e-commerce store. This means getting to know your own business. It’s not just important when you talk to a designer or whoever will create your website. This is important when for you too. You won’t believe what you can find out about your own business. Which products or services do you sell? 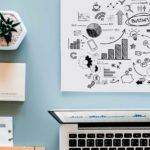 What are some alternatives to your business offer? This will identify the starting point of yours or my research. It will provide the basic info that will assure you that you can see what they are doing and where you stand compared to them. It will also show how you differentiate from them. Well at least on the basic scale. And that’s the basics that you need for conducting proper keyword research. My next step would be to dive into the keyword research. That’s right all the fun starts here. You are going to go on the internet and start research keywords and terms, that can bring in traffic. You know the traffic that can increase your revenue. You’ll notice that in this article I am using free tools that in my opinion can really help you better understand the work and the process as you can try them yourself. However, I must say that paid tools have even more data to give a bigger edge when doing research for your businesses keywords. The first thing to do is install a Google Chrome or Mozilla Firefox addon called Keywords Everywhere. This tool will show you search volume and the competition that you would be facing. Just as shown in the image below. 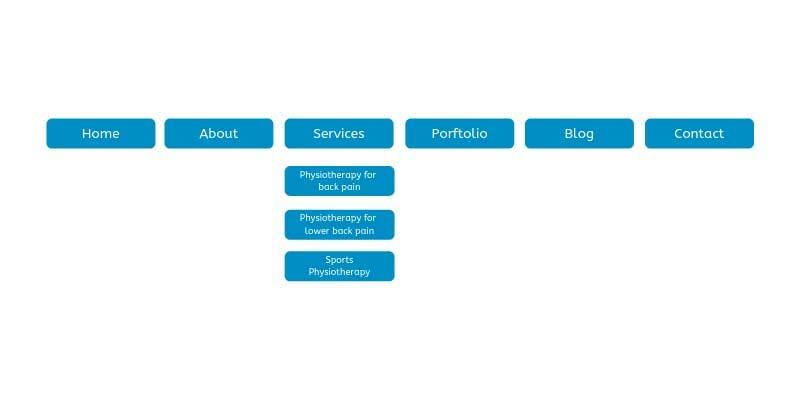 Let’s propose that you have a Physiotherapy business and you want to have a new website. 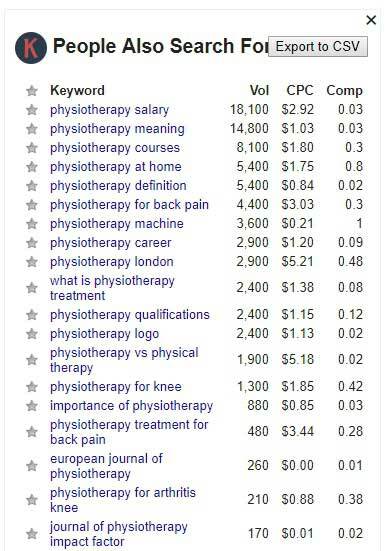 In this case, I searched for the main term Physiotherapy. You can see the search volume, cost per click and the competition. But this shouldn’t be what you are after yet. As probably this will be your new websites main keyword that will describe your business. Next, you want to check the related terms that are usually at the bottom of the Google search page. Save these terms into your sheet or document with search volume and competition. Next, see what Keywords Everywhere has found in related terms on your right side of the search page. Save these too. You can see on the image that you can export these terms to CSV. Then you can easily add them to your Google sheet document. There is one nice feature in Keywords Everywhere that shows you what else to people search for and it’s usually quite a long list. This doesn’t mean that all of these keywords are right for you. At this point, you are just looking for ideas and keywords that could help you. This is under the related keyword on the right side of your screen. But this should only be the start of your research. Save it, so you will be able to check it further. I’ll recommend Google Docs or some other software like Microsoft Excell (you have an online app that is free if you want to check it out). Before jumping into the next tool… You should go through all of these keywords that you have now and see if you can get even more ideas from related searches. To do that just Google all of your keyword one by one. And then go and Google the ones you find again. Make sure you are putting them into a spreadsheet and writing down the search volume and competition. For the competition, I would say that if your website doesn’t have a big authority or it’s a new website, don’t go over a competition score of 0.20. As with these keywords you are looking to first get the initial traffic that will boost your website performance. Of course, at the end of it, you should eliminate the duplicates, so you don’t go through the terms that you have already examine. All these keyword researching will also show you what kind of search intent is behind them and what types of post you should be planning. It’s important that you don’t create a post for a search term that Google is ranking only products because you won’t have any chance to get to the top, no matter how easy the competition or how good your post is. In this step, we are technically still at keywords research, but we are going to go further into the competition of your website. We will look at what kind of estimated traffic do websites get from your previously found keywords. It’s also important to check for keywords ideas on websites from your main competitors. This will give you an idea of how you can do better. So the next step is to take one keyword and check who ranks for it. 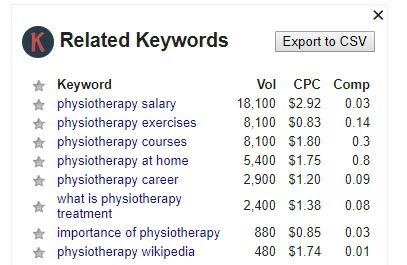 I took the keyword “what is physiotherapy treatment and search it in Google. See the image below. I took the website that is first on the list. You should at least go through the results on the first page. To find even better opportunities it’s a good idea to go and research the second page too. Now that you got the website URL, go to Ubersuggest. Paste in the URL and see their best pages. As you can see there are the top pages of the selected website with the option to view more. You can also see that the estimated visits are high. Which means that they get a lot of traffic from organic search. 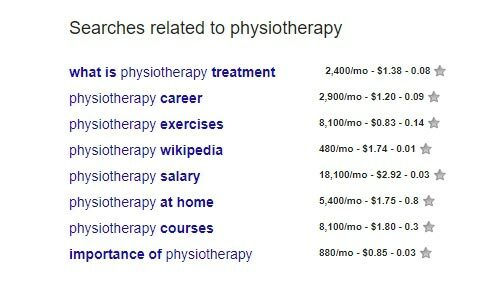 Note: As Google is showing local search results for physiotherapy I chose the term what is physiotherapy treatment. So I can show you how you can help your business and find the competitors and try to outrank them. At this point, it’s about the domain and the keywords associated with it, not just about the topic. But you will look at specific pages on those websites to find opportunities in that topic. Besides the estimated traffic, you can see the “view all” button, shown in the image below. We will look at what keywords are associated with that particular page on that website. This will help with that topic. Now click it and the keywords that the page is ranking for will be shown to you. Like this. First, you’ll see the first 10 keywords. You have the option to see the search volume, SEO difficulty, estimated visits, where the page ranks, etc. You can also see the next 10 or export the keywords to a CSV file, which can be opened with Excell or Google Sheets. Now search for keywords that have a good amount of searches and low competition. I would suggest that you search for keywords with at least 100 searches per month, ideally at least 500. Also, if the website is new or it has low domain authority search for keywords that have low competition (bellow 20). Now if we look at the list we can immediately see two great keyword opportunity. These two keywords have a nice search volume and quite low competition. Also, these two are a great fit for a post. That’s how you do it for every keyword and the competitors. Even for the competitors that you know from before. You check them out and maybe you find a good opportunity that you can exploit. Of course, we want to inspect further. So we copy them and open a new tab with Ubersuggest and paste it into a search bar and we get what is shown in the image below. You can see Neil Patel telling you that this keyword is quite easy to rank and you have a 90 % chance to be in the top 20. With a good post even higher. But that’s not all that you can get on this page. Below this screen, you can see suggested keywords. Those keywords can help you understand what people are actually typing into Google search. They are nice to have in your post body. 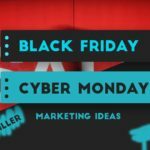 But don’t go overboard, as keyword stuffing won’t get you anywhere. Remember to save your keywords and exclude the ones that are not a fit. Get as many keyword ideas as possible and then by checking them exclude the ones that won’t work. 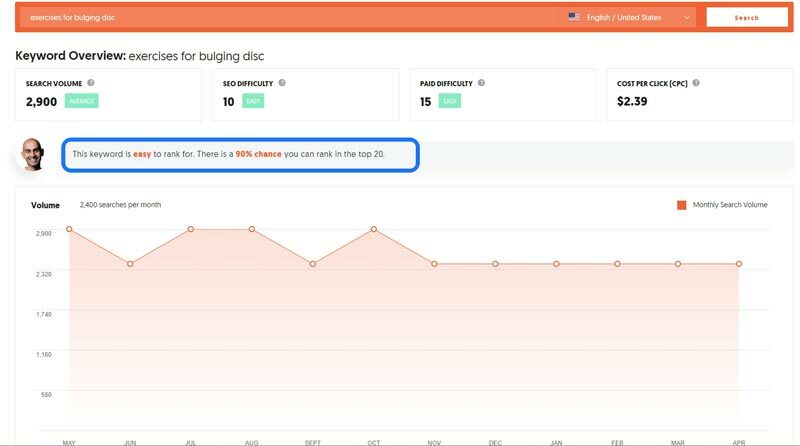 After you inspect the whole list of your keyword and you have only the ones that are increasing your chances of ranking high, you start adding content titles. Also, you now have a potential traffic estimate. Now think that you get 10 or 20 % of that traffic, what will that mean for your business? This can be done for any keyword and any website that you want to inspect and improve your SEO game. Make sure you position yourself in the shoes of your customer. The right customer. Also, check what types of post are on the first page, so you know how to formulate your post. Is it a list or an infographic, or an educational post. Also, be sure you look at what kind of results are on the first page. 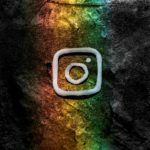 Are there pages that are commercial and are selling or are there products? This will tell you that the keyword is good for ranking a product, not a post. Be sure to check these things as it determines the user search intent. Well, at least Google is trying to guess it (and it’s quite good at it). Just remember to select the country in which you are trying to rank so you get the relevant data. For this short research, I selected the USA. 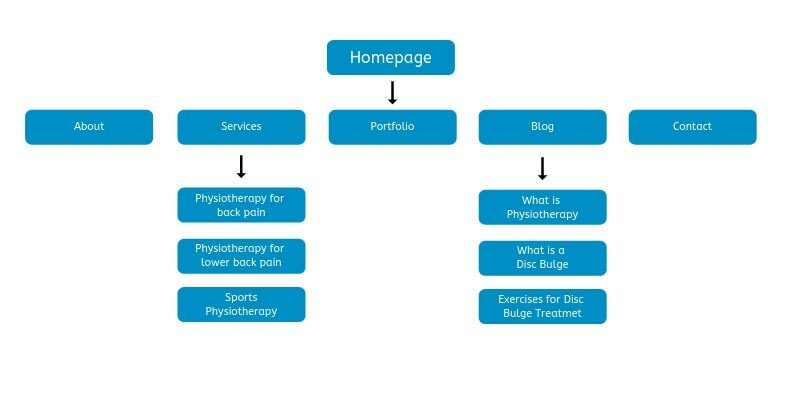 So now that we have done the research we can go on to our main task plan a website structure. Now, this is where your work starts for real. In this step, you will basically create a system that will order your data in a logical and user-friendly way. You create a diagram with the main pages on top and then go from top to bottom to structure your topics. Make sure it’s simple. This will help you and once you go and start creating your navigation and URL structure. I did this in a free in Canva editor. But you easily create this in a spreadsheet program. Don’t create too many categories. Make sure you are somewhere between 2 and 7. I know that If you are a large business you’ll have more. If possible make sure you create a symmetrical structure or close to it. We as human love even things in visuals. But, as you’ll see that’s not possible in every case. So this is what it looks like in a simple way, but let’s get a bit more concrete. Now let’s see how it all pans together. Most common URL structure looks like this. You have a homepage, services, about us, references/work, blog and contact. 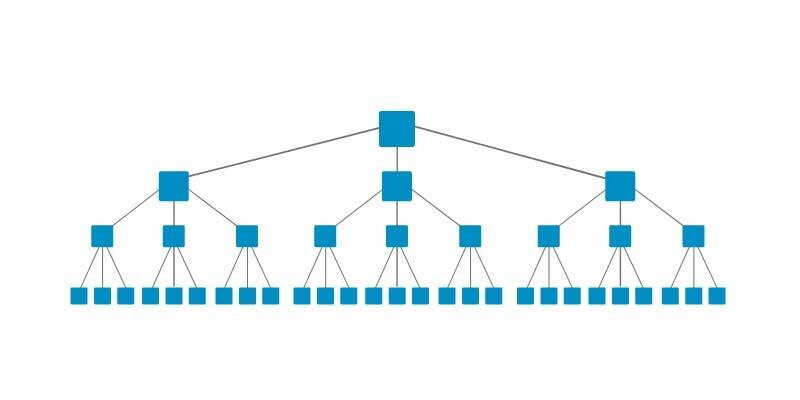 This will represent your hierarchy, URL structure, and the main navigation. You get something like this, a simple website diagram. From this, you can easily get your URL structure. As you can see I use words. Make sure your URL structure uses words instead of IDs, symbols or date formats. This will enhance your SEO and it will be more appealing to your visitors. Where possible use keywords in the URL, especially important for your blog posts. You can see that in the example structure too. When creating your URL structure, make sure you use hyphens (-) as seen in the above example, don’t use underscores (_). This is better for your SEO and user experience. But you ask what about an e-commerce website? Well, your steps should be the same. And the URL structure with your diagram would look something like the image below. Of course, your’s will have its own categories. Now that you got the URL structure it’s time to create your navigation. If you plan your website structure like shown above you shouldn’t have any trouble creating the navigation for your website. A similar principle goes for your e-commerce website navigation. So here is an example of that too, so you can get a better picture of how it looks. Make it lean, which means that your most important pages aren’t buried too deep into your navigation and URL structure. Don’t blindly follow the 3 click rule, but make sure that your main pages are easily accessible. Meaning that your user doesn’t have burry himself into your pages to find the information that he is looking for. The safest way for crawlers to be able to read your navigation is to create your navigation with HTML and CSS. Stay away from JS, flash, AJAX, because it can limit access to your navigation. And that would be bad for SEO. I’ll also include here that your header should include the name of the page and all of your top-level navigation as shown above. Don’t put too many elements in your top-level navigation as it will be both confusing, bad UX and clustered. You don’t want that. Make it something like mine, simple and easy to use. You have probably noticed that the navigation is usually also put in the footer. Basically sites that are not in the main navigation. Just don’t put in your single products. That does not belong there. So what does internal liking do? In simple it pours the “SEO juice” or authority of one page to other pages that it’s linking to. It’s an important part of SEO. You can look at it this way, if your website gets the majority of backlinks to your homepage, it’s important that authority from your homepage gets shared to other pages. 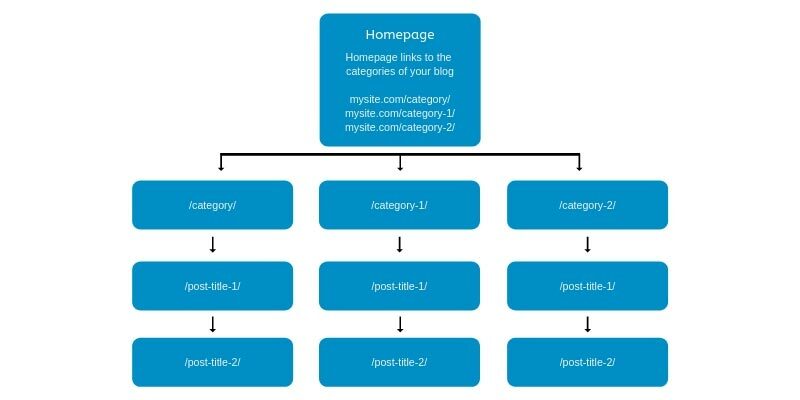 Some go through your navigation, but you want some of it on your blog posts and category pages if you are doing the Silo structure (will be shown below). Internal linking is what makes your website structure to work for your website. It helps the structure to be logical, help users navigate your website and it establishes your shared informations hierarchy. Internal linking is also helping Google bot and other search engine bots to find your content and pages faster when you add new ones. In basic, every page should link to at least one and get a link back from at least one. This is the basic internal linking structure. To really enhance your SEO it’s a good idea to build a Silo structure or Topic clusters for your blog categories and posts. Remember that the more you link between your pages the better. This will pass the authority from your homepage to your categories and from that to your posts. It’s important to know, that you avoid, as much as possible, linking between the categories. Your internal links should only be passed between the posts in the same topic category. 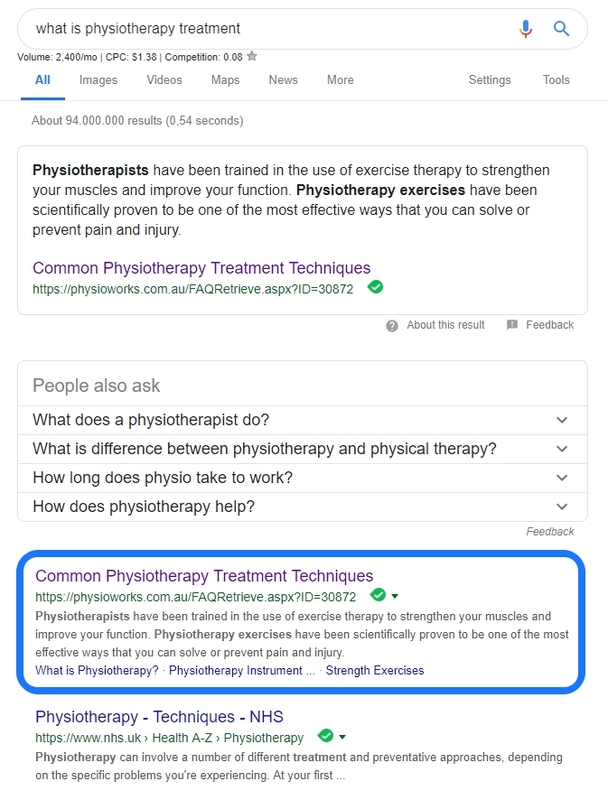 What I found great (I still plan to incorporate that) is that you can use your category pages as an intro to all of your posts on a specific topic. It will turn out as a giant book with chapters. The best part is that it won’t only look great and appealing it will also help you with SEO. Okay, this is the last one. If you have done all of that you can plan out the sitemap too. It’s basically all of your website’s pages in one file that gets constantly updated. The thing is that most search engines use sitemaps to find out about your new pages. It also helps search engine to index your pages faster then if you don’t have one. There are many tools (Sitemap Generator) to do that, but most CMSes have something installed to create it. If you use WordPress that a good plugin to use is the Yoast SEO plugin, that will generate it for you. Now that you have your website structure, you have your potential traffic, you have a starting content strategy and you know how your site will work. With the potential traffic, you’ll be able to plan out what would it mean if you get 10 % of that and you can then focus on what you need to convert your visitors. You can be sure that your website has a solid foundation and you will be able to build up your growth on it. If you do it like this you’ll get better SEO results resulting in higher ranking. Always plan ahead and then go to create your design and how the website looks. That way you assure yourself that the website will have the potential to grow as needed.